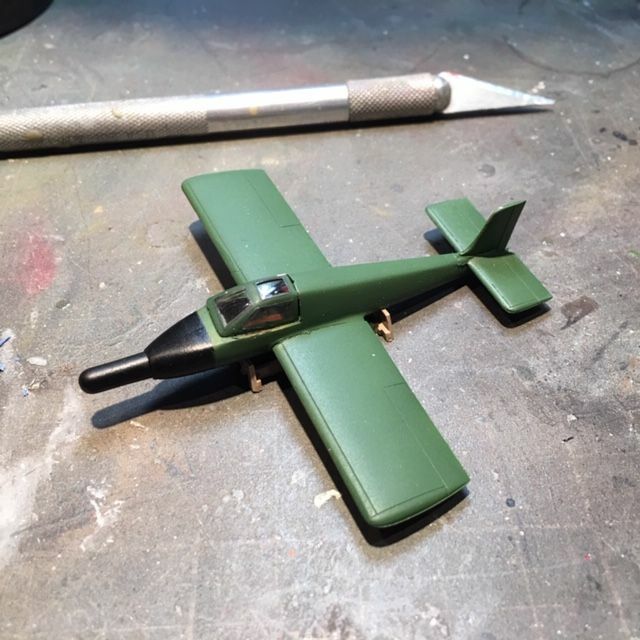 The second kit for the bench probably has to be the smallest 1:72 scale kit I ever built in the form of Brengun's Zeppelin Rammer. This project was first proposed in November 1944. The "Rammer" was to be towed aloft by another fighter (most likely a Bf 109). Once released, the pilot was to ignite the solid-fuel Schmidding rocket, accelerating to 970 km/h (602 mph) and then launching its 14 R4M rockets at the target. A second pass was then made, this time making a ramming attack with its reinforced wings. 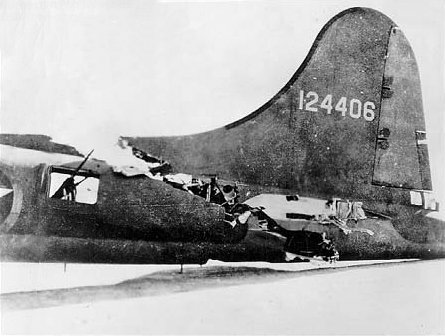 It was calculated that at the attack speed the aircraft could cut cleanly through the tail section of a B-17 without great loss of speed or stability. After attacking, a gliding landing was to be made on a retractable skid. 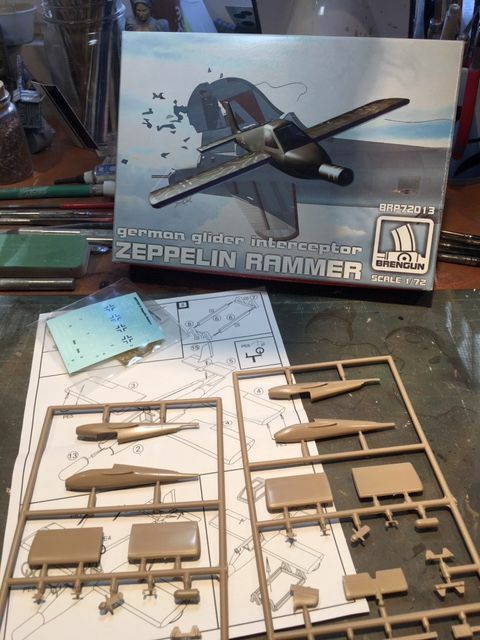 Looking in the box, Brengun gives you enough parts to make two Rammers. The back of the box gives you 3 paint schemes, sort of indicating that it saw service. I chose to create the 3rd option - The Trudi - from late in the war. The second two apparently were named. The middle one is Anna. What Brengun lacks in attachment points, it makes up for in detail. The plane has quite an extensive amount of PE for such a small plane. 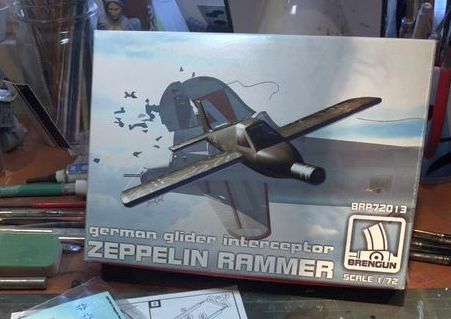 while the Luft '46 page says that it had a rocket motor, the Brengun box says it was a glider, and no rocket motor is included. The plane is also supposed to land on a skid. While there is also no skid included, if you look closely at the panel lines you see this off panel on the bottom. It is the retracted skid. I guess if someone wanted to do micro surgery, that skid could be set up in landing mode. My eyes aren't good enough for that. The cockpit is the first thing that needs to be tackled. For such a small plane it includes a full seat, a stick and a small instrument panel, with 3 indentations for gauges. The insides was painted gray with a dark wash. The seats were highlighted with VMC Red Leather, and then washed with Citadel's Agrax Earthshade. the foot pedals are painted silver according to the directions. Too bad 99% of it won't be seen after the canopy goes on. Putting the remaining part together I should have attached all the PE. But I got carried away and started painting. 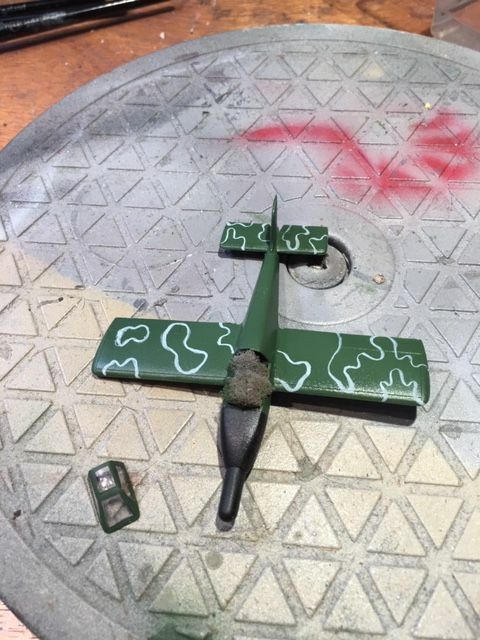 The scheme I chose was RLM 82 (lightened a bit) and a black nose. 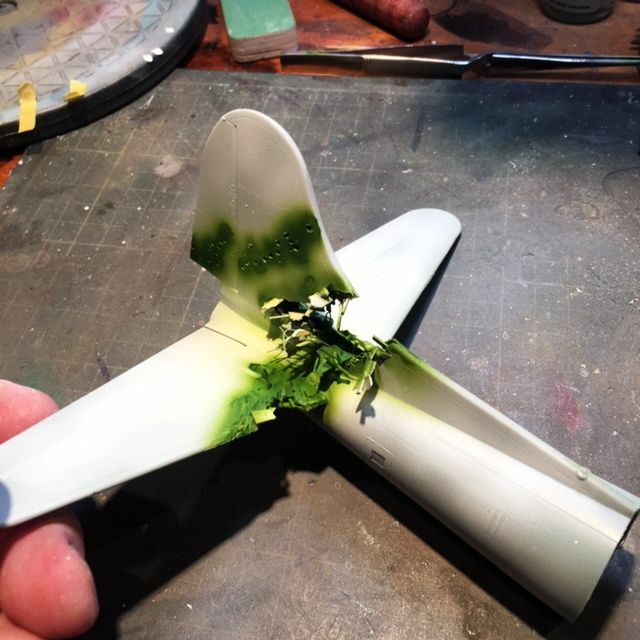 The instructions say the underside of the wings are to be RLM 83, which looking it up is also green, but the painting guide on the box shows, that I think it's meant to say RLM 76 or 77. I have 76 and that's what will go on there. Check back for the PE installation and my idea for a little vignette. Thanks for looking. The canopy is only sitting in place in this pic. Since there is no pilot and I'm thinking of making an "in action" vignette, I darkened the windows with a black wash. I also added the decals. I thought I had a pic, but no. I'll get one asap. The story behind this was that the gunners shot down a Bf-109. It goes on to say the plane flips upside down (out of control?) and the wing slices thru the fuselage front to back. You can read an account HERE . This is going to be my inspiration. 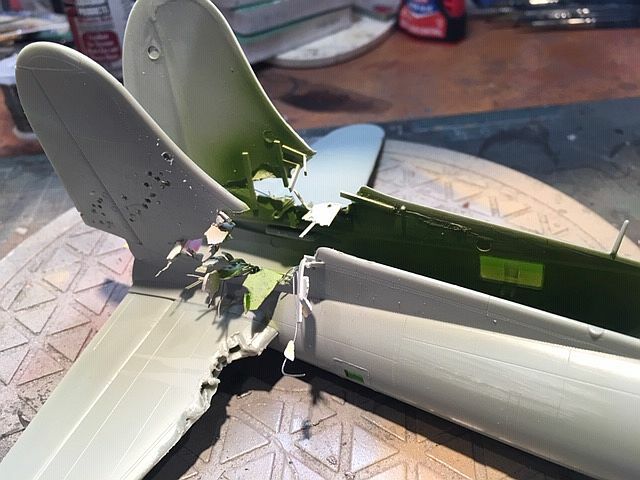 Next step was to look for a 1/72 scale B-17. Obviously since I only need the back 1/3, I wasn't about to pay a lot for it. 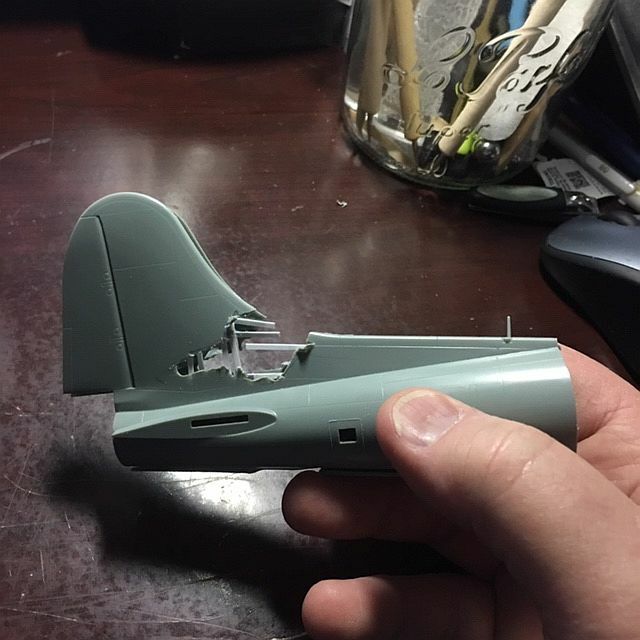 As if on cue I get Megahobby's email newsletter, and after a short look, I found an Airfix Memphis Belle for $17! Sold. 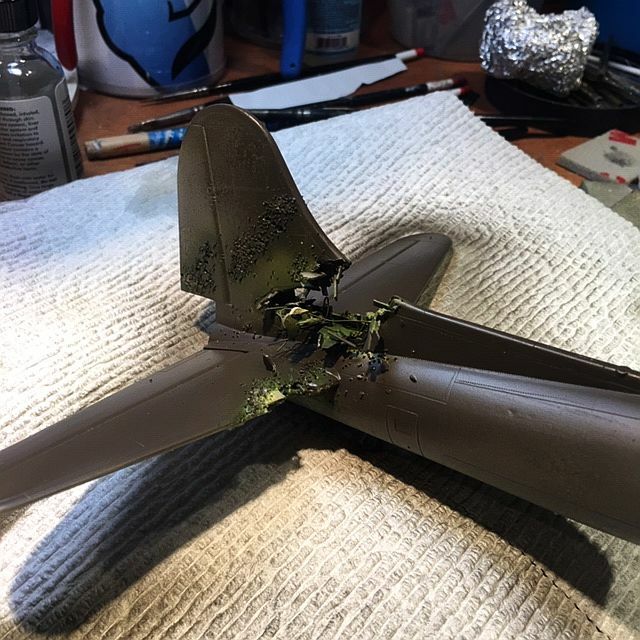 Since the Belle was too famous to destroy like that, MegaHobby also had a set of generic B-17 decals. I bought those as well. Getting the kit, the first thing to be done is cut away anything I'm not using. I made my cut right behind the ball turret. Then I took a pencil and drew out where I wanted the damege. Then it was time to take the dremel to the plane. More details will be needed, but this is it for now. Thanks for looking. Zinc chromate color has been added as an undercoat in prep of the hair spray and salt techniques. 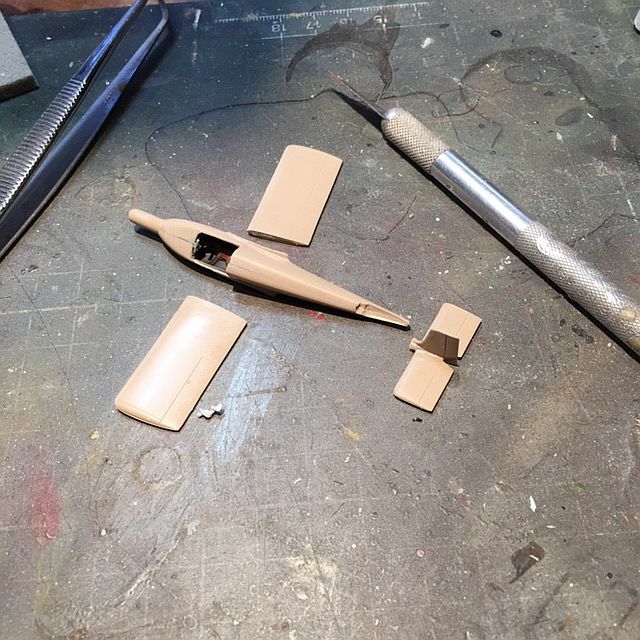 We start this last chapter of this build by adding the decals to the tail and along the side of the fuselage. While that was drying, I took and oval base and painted it sky blue, and then some white to mimic clouds. Once the decals were dry I then went about to destroy them. I scratched the tail decal up, especially around where I had already drilled the bullet holes. 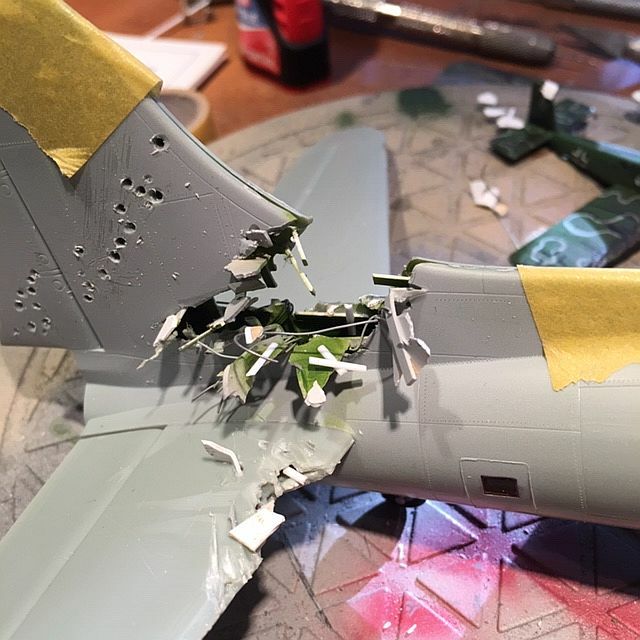 From there it was just a matter of weathering it so I added a little V Smoke and then some black dots to replicate shrapnel burns. Then it's time to install the Rammer. 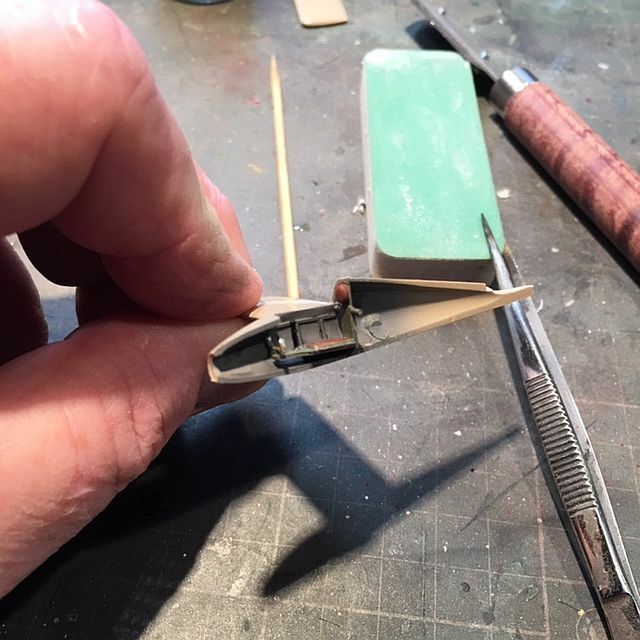 I had already measured a clear rod to fit thru the wound and then down thru the open landing gear door. 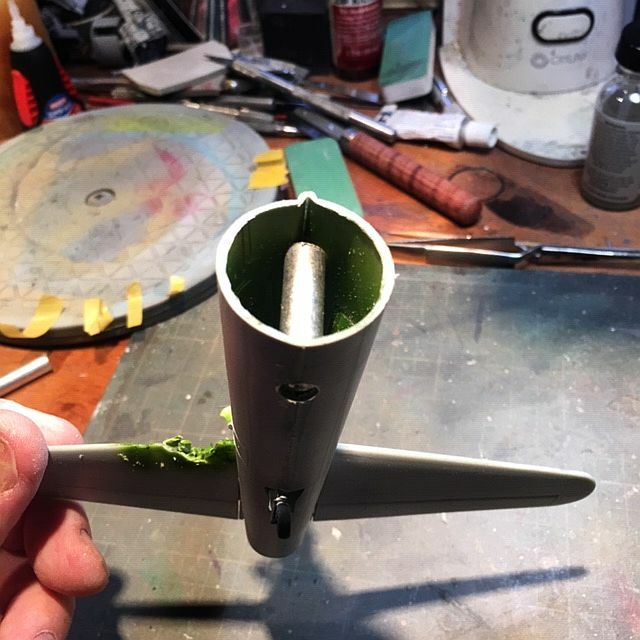 All that was left was to measure the the length that I wanted to make the Rammer from the bomber, cut it and then drill the end of the rod to an angle to settle the Rammer into space. Once that was done I called it finished. Thanks for looking. Wow! In a word: dynamic! Nice work and excellent execution of the idea! Great work and idea Kev! Definitely a change of pace from real space modeling. Oh wow! What phenomenal work! I'm overwhelmed at this incredible little aerial diorama! Fantastic realism and incredible drama! Love the attention to detail. Awesome presentation!